Mm, chai tea, how are you so delicious? Warm in a mug or cool in a iced concoction, loaded with spices, sweetened up with sugar, creamed to perfection with milk… you are the stuff of dreams. Of hot sticky summer days and bitterly cold winter afternoons. Of quick escapes from the lab with friends, dashing to our favorite local coffee shop. Of fond memories and future adventures. You make my heart smile. While I can’t say I’d eat this cake as often as I drink chai tea (but, HELLO: check out this epic guide for making your own chai tea! ), I will say that this cake is incredible. Spicy and sweet, the subtle chocolate flavor is mostly lost to the warm, fall-flavored spices. Trust me when I say you won’t mind. My favorite part is the drool-worthy cinnamon cream cheese frosting, though, and this recipe will leave you with about a cup of extra frosting that is a perfect spread for graham crackers. This cake would be ideal for any fall or winter celebration (cardamom, cinnamon, cloves, nutmeg, and ginger are the stars of cold weather) as a unique alternate to pumpkin, gingerbread, etc. treats. Your guests will love you for sure! 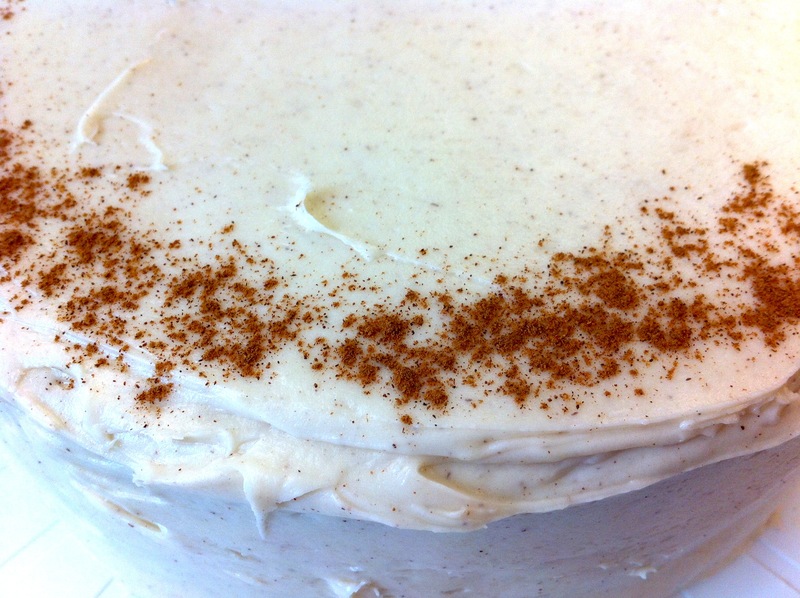 Check out all those flecks of cinnamon in the frosting, and dusting the top! These are the little things that make life special. This recipe comes from What Megan’s Making. She adapted a Taste of Home recipe for chocolate chai mini loaves and turned it into cupcakes. Brilliant! I doubled her ingredients and made it into this delicious cake. I’m pretty sure that however you choose to eat this, you’ll agree: masala chai spices are fantastic in baked goods! 1. Preheat the oven to 350 degrees Fahrenheit. Prepare three 9-inch cake pans by greasing the bottoms and sides, cutting out circles of parchment or wax paper and lining the bottoms of the pans, and then greasing the paper tops. Set aside. 2. Whisk together the flour, spices, baking soda, and salt in a bowl; set aside. Melt the chocolate and water together in a microwave; stir until smooth. Cool slightly. 3. In a large bowl, cream the butter and brown sugar until light and fluffy. Add eggs, one at a time, beating well after each addition. Beat in vanilla, then chocolate mixture. Add the flour mixture to the creamed mixture, alternating with the sour cream. 4. Divide the cake batter evenly between the three pans. Bake at 350° for 20-25 minutes (rotate halfway through) or until a toothpick inserted in the center comes out clean. Cool for 10 minutes before removing from pans to a wire rack to cool completely. 1. Beat together the cream cheese and butter in the bowl of an electric mixer until smooth and well-mixed, about 2-3 minutes. Mix in the vanilla extract. Gradually beat in the powdered sugar until completely incorporated. 2. Keep the mixer running while you sprinkle in cinnamon. Sample periodically and stop adding cinnamon when you can see flecks throughout and it tastes good. I probably added about a teaspoon when it was all said and done. 1. Prepare your cake plate by placing small strips of wax paper in a circle about the size of your cake (this will catch the frosting spills and keep your plate looking pretty). 2. If necessary, use a serrated knife to level off the rounded tops of each cake. Place one of the cake rounds on the wax paper circle (the wax paper should be partially under the cake), with the serrated side facing up. 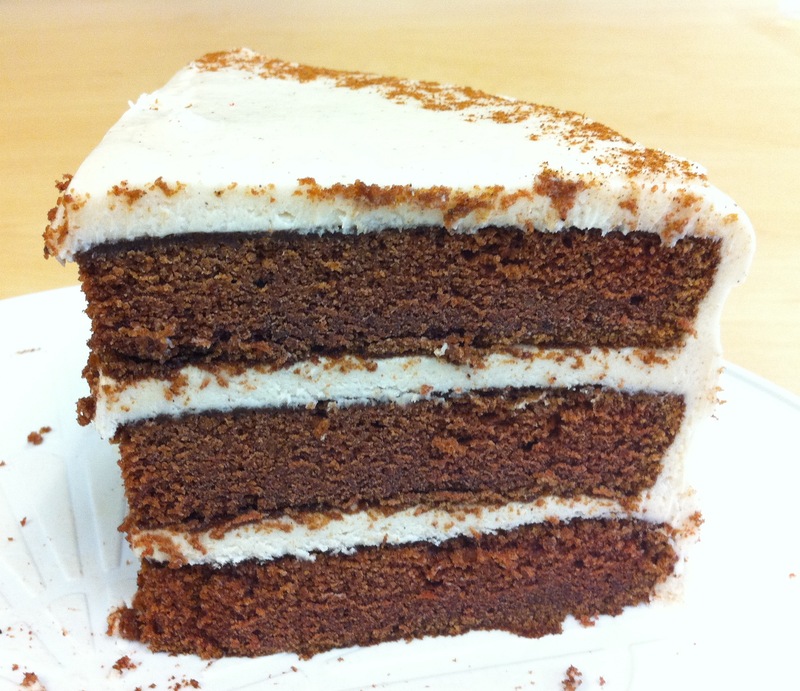 Put a generous amount of frosting on top and smooth it out to an even layer. Put a second cake round on top and spread more frosting on generously; place the final cake round bottom-up so the top is smooth. 3. Spread a thin layer of frosting all over the sides and top of the cake. This is called a “crumb coat” and will effectively seal in all the crumbs, so when we frost “for real” later, it’ll look magnifique! Put the cake in the fridge for 10 minutes. 4. Remove the cake and frost with generous scoops of frosting, spreading it all over the sides and top. Leftover frosting (I had about a cup) can be eaten with a spoon or used as a dip for graham crackers, pretzels, etc. 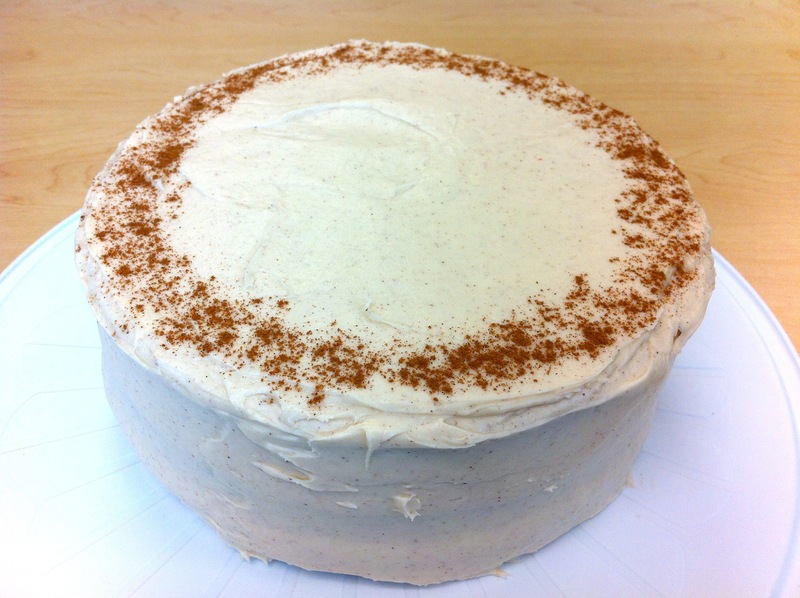 If you want, carefully sprinkle cinnamon on top of your cake for decoration. That’s it! 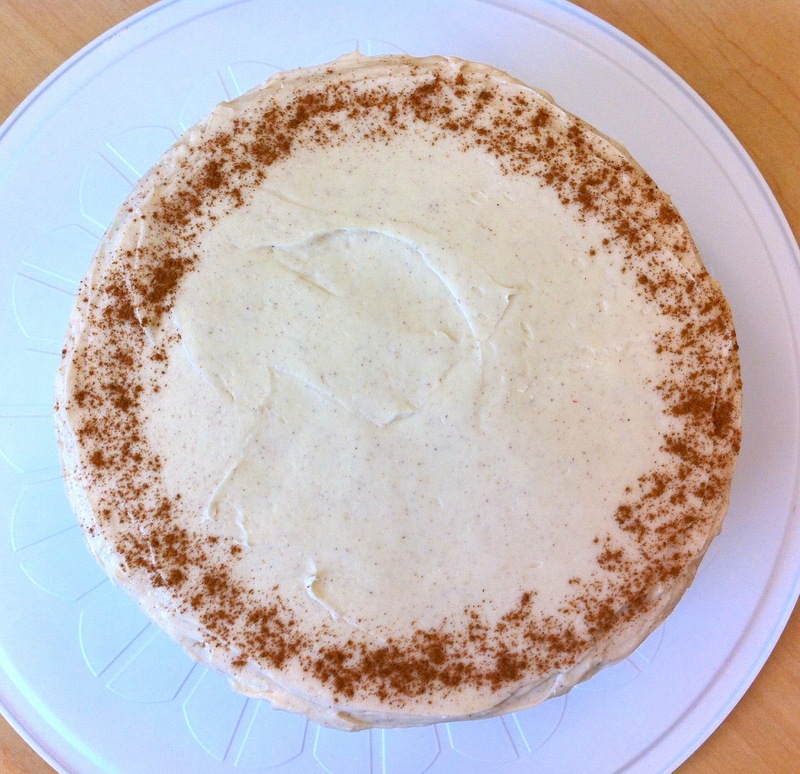 All the flavors of chai tea wrapped up in one marvelous cake and perfectly paired with the best cinnamon cream cheese frosting. Your house will smell incredible, your taste buds will thank you, your guests will compliment, and you will beam!